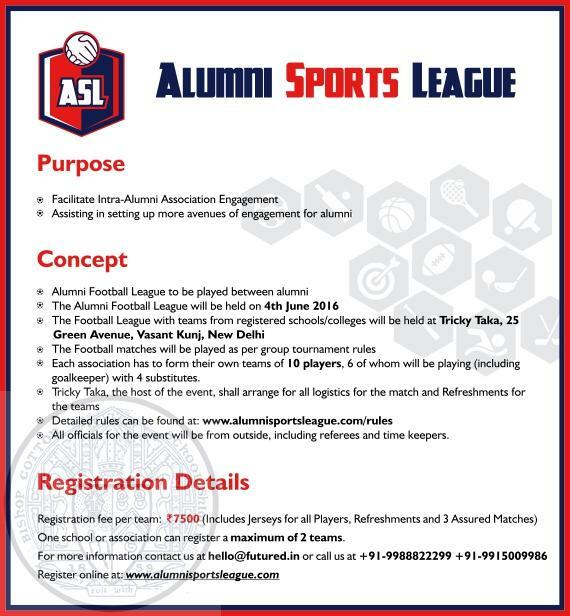 Alumni Sports League is an Intra-Alumni Association Engagement event which aims at establishing a culture of Sports Leagues among alumni in leading schools across the country. Through this, we aim to harness the massive passion and unifying power of sports towards a common cause of working together for many more future collaboration opportunities. This highly engaging event will also provide an opening to revive healthy competitive spirit among old-time rivals! Alumni Sports League begins with the Alumni Football League (6 a side football on turf) which will be hosted in New Delhi on Saturday, 4th June. This event is being organized by FuturEd & Tricky Taka. We are looking forward to bring together elite schools such as The Doon School, Welhams Boys, Lawrence School Sanawar, Bishop Cotton School Shimla and more for the first edition of this tournament. You can visit our website www.alumnisportsleague.com to get your team registered. This entry was posted in Events, Post and tagged sports on May 29, 2016 by admin.